American Catholics have widely accepted the changes in the Roman Catholic Mass to reflect a closer translation of the Latin that was introduced last year, even if these revisions may signal greater centralization in the church, according to a new survey by Catholic University of America researcher Anthony Pogarelc. 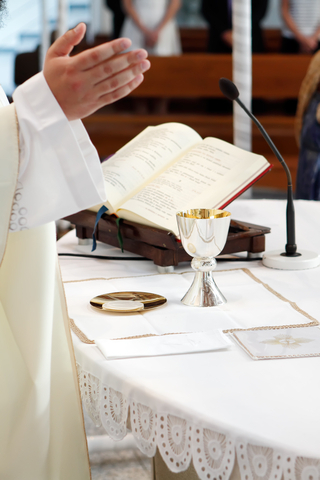 The changes to the liturgy introduced by the Vatican included a more literal translation of Latin texts used in the Mass, a greater distinction between sacred and secular language (such as using the term “chalice” rather than “cup”), and more scriptural allusions. Pogarelc’s study, was presented at the meeting of the Society for the Scientific Study of Religion in Phoenix, Arizona, which Religioscope attended, and was based on a sample of 1,047 Catholics. The survey found that 70 percent “agree” (50 percent) or “strongly agree” (20 percent) that the new translation is a good thing for the church, but such acceptance was tied to the degree of participation in parish life. But on the question of whether the new translation helps them understand the prayers, participate more in the Mass, or feel closer to God, inspiring one to be a better Catholic, there was no significant difference between the earlier translation and the one adopted last year. In fact, Catholics born before 1942 who had reported a high rate of understanding and appreciating the Mass in a 2011 survey , showed a significant drop in their responses in the recent study. Millennials, those born in 1982 or later, were least likely to register strong agreement about the new Mass. This may reflect the lower rate of participation by this generation, Pogarelc said. Pogarelc added that the changes introduced by Pope Benedict XVI showed a concern for greater standardization of the Mass, making it more uniform throughout the world. The previous language of the Mass was based on various translations offered by national church offices rather than on one translation common to all Catholics. He added that such a shift is in line with greater centralization in the church and runs counter to greater decentralization of the church bureaucracy introduced by the Second Vatican Council.